There are so many reasons to make some changes in your home. However, how to renovate your house not getting involved in long and expensive repair? Here are a few simple but handy tricks. The easiest way to change your house or apartment is to change the look of the walls. Paint the walls or just hang new wallpapers. If the walls are uneven, embossed decorative plaster or thick vinyl wallpaper with abstract design can handle the problem. If you have painted walls, decorate them with patterns using stencils or masking tape. Hang posters or pictures on the wall, placing them densely. They’ll not only allow hiding the wall defects but also create an impressive decorating effect. Besides, you can cover the wall with a sheet of drywall, plywood, or cork. The best cordless impact wrench allows installing any decorative item without much effort. Later if you get bored, the sheet can be easily removed. Interior golden rule says: add as more lamps as possible (but not overdo it). Proper lighting can change the room appearance beyond all recognition because the lighting is able to influence the mood in your house. Floor lamps, sconces, table lamps – everything will help. Sometimes, all you need is to replace a lampshade. Another trick: change your cold light lamps to the warm ones, and the house will become more comfortable immediately. Upcycling, or creative reuse, is another smart option. The things that you would throw away previously get the second chance. Old furniture is very popular today so don’t be so quick to get rid of it, contact any the workshop near you and get old chairs and couches restored. However, you can do everything all by yourself: paint, change the fabric, or decorate it. Maybe it would be for the best because you’ll make your furniture unique for real. 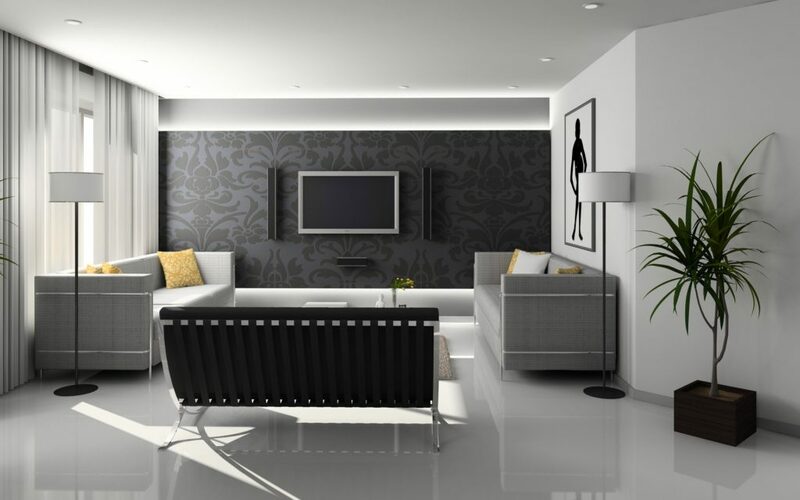 Any empty space will be eventually littered with different items, but emptiness doesn’t make your house look attractive as well (unless it’s the minimalist design). The best way out is to plan your “mess”. If you have a collection with different souvenirs, it can become a great decoration. Let’s say you have many vases: try to make a still life out of them. It’ll make your house look much better even without flowers. This trick adds more order to the interior. Another tested method is textile. Don’t be lazy to “dress up” the house according to the season, for the holidays, and just to improve your mood. You can renew not only curtains and couch cushions but also bed linen, napkins, and tablecloths. Don’t forget about houseplants. Doubt your gardening skills? Choose succulents then. They’re not demanding and look very spectacular. Measure twice cut once. Everyone knows but not everyone does it. There should be enough paint for the whole wall, curtains bottom edge should reach the floor, and a new lamp style should not only match its surroundings but also have a harmonious size. Everything will be as you plan if you take the necessary measurements carefully in advance. It’ll save your money, time, and nerves. As for the rest, don’t be afraid of changes and use your imagination. You can also place some smart trash cans to make your house better.